The audio amplifier shown here is based on the TDA7240 IC from ST Microelectronics. The TDA 7240 is an integrated audio amplifier IC that can deliver 20 watts of audio output power into a 4ohm load. The IC has minimum external parts count and is available in the 7 pin compact Heptawatt package. The IC also has a lot of good features like loud speaker protection, short circuit protection, low noise, low distortion etc. 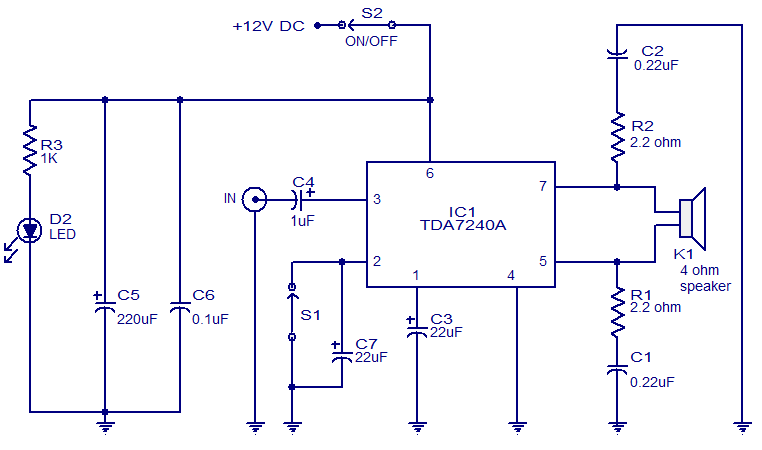 The circuit can be operated from a 12V DC single power supply and this makes it very useful in car audio applications. K1 can be a 4 ohm, 20W speaker. S1 is the standby switch and S2 is the ON/OFF switch. LED D2 is a power ON indicator. Fit the IC to a proper heatsink. Gate 2012 Application-You have got one more day! What if I use an 8 ohm speaker? Will the sound be half as powerful? Can I change the resisters R1 & R2 so that they limit less current. Say make then 1.1K? What is a standby suiitch? which is it use? sir what must be the voltage of every capacitor.? C5 ,C6, and C7 should be at least 25v capacitor. The voltage of the capacitors that are directly attached to the power supply terminal should have the voltage greater than the voltage of power supply. For other capacitor you can use any type of voltage. But select at least 16v that’s what i recommend. can we use 9V battery for supplying power to this circuit.plese respond quikly. but if i make 2 of this amps two separate amps, how to Connect the wires from the two amplifiers. I’m planing to make a 5.1 Surround sound with 6 of this amplifiers, and now I’m curious about quality of this amplifier. hi noob you can use any number of amplifiers with single car battery. can i power two of this audio amps with one car battery, i want to make a Stereo amplifier but do not want to use 2 batteries, please answer. I would like to get wor from computer power supply unit,witch can get 12v and 5v dc.As u know it is swtching power supply unit.Tell me what kind of changement it has to give to reach my goal. please give me the full details of “20W audio amplifier using TDA7420” ie. with their cost, the devices required…..